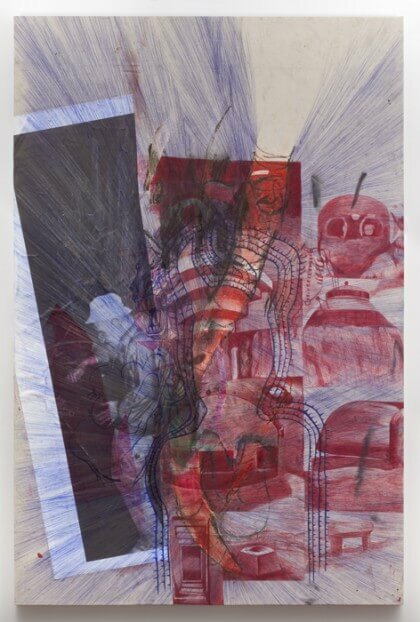 Swiss Institute is proud to present the first exhibition of the collaborative work of New York artist Rita Ackermann and Nashville based director Harmony Korine. The show consists of large-scale paintings on vinyl and canvas, several drawings as well as one film, creating a grand presentation with dissonant overtones. 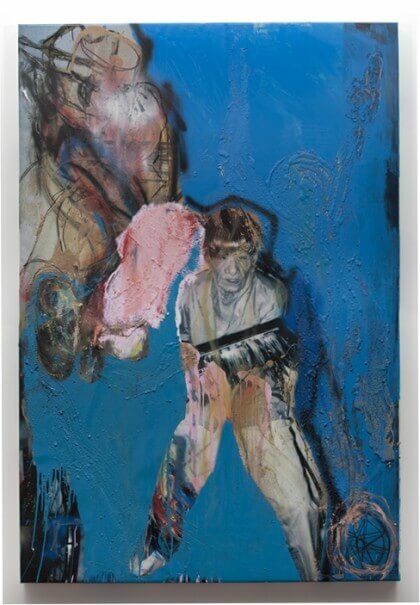 Renowned for seminal works in the respective mediums of film and painting, Harmony Korine and Rita Ackermann meet and overlap with their shared interest in unorthodox and mischievous beauty. Central to the praxis of both is the creation of psychologically jarring figures, whose presence is further enhanced by fragmented narratives. Shadow Fux, the artists’ first collaborative presentation aims to create a veritable alien, who stalks the viewer from the fringe of the exhibition space. 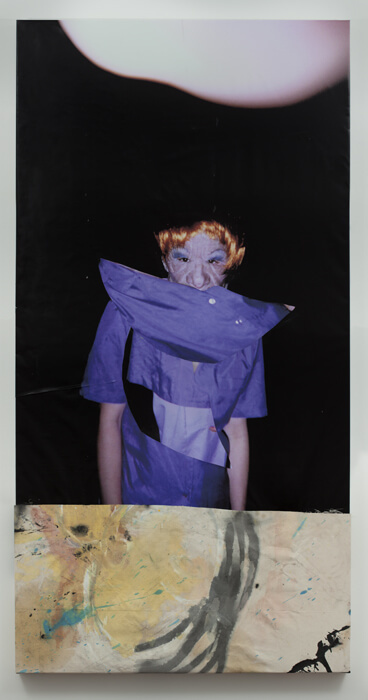 Taking the recent film Trash Humpers (2009) as its point of departure, the exhibition features large scale works in which Ackermann and Korine have collaged, painted, and drawn over stills of the film’s beguiling young bodies with old faces. Produced in a call and response method, the collaboration illustrates the importance of cutting to both artists’ works. Editing and splicing, Ackermann and Korine insert absurdist moments into narrative tropes, subverting plotlines and ultimately defying our expectations towards story telling. 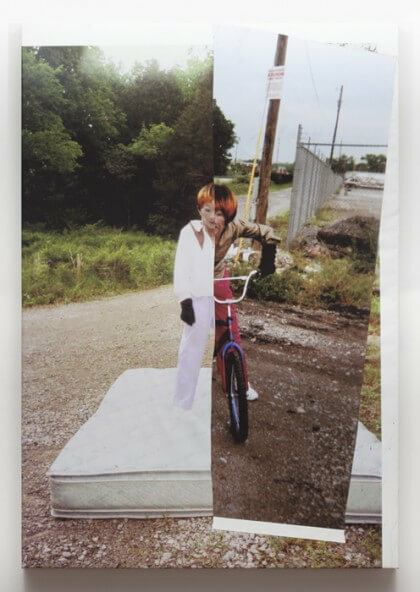 Bmxhex (2010), a towering collage, is composed of two scenes––a redheaded half-figure standing on an abandoned mattress, and, grafted onto it, a quarreler sitting on a BMX, ready to take off. The composition is a phantom for the split personality, which runs throughout the show. The eerie paintings and their filmic complements are an unyielding monument to the freak, the hysteric, the rake, and the eccentric. 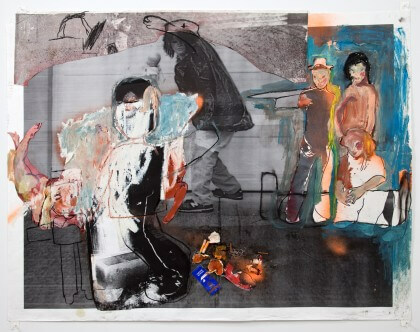 In the painting, sekret clubs(2010), a family of coquettish elders emerges from a thick coat of paint, which has been scraped down, reworked, and built up again. This rising ruin finds similarity in an adjacent film, deleted scenes from “Trash Humpers” (2010). Lunatic screams ricochet throughout the gallery, the din provides a voice for the otherwise silent painted figures.